A change of pace from rice. 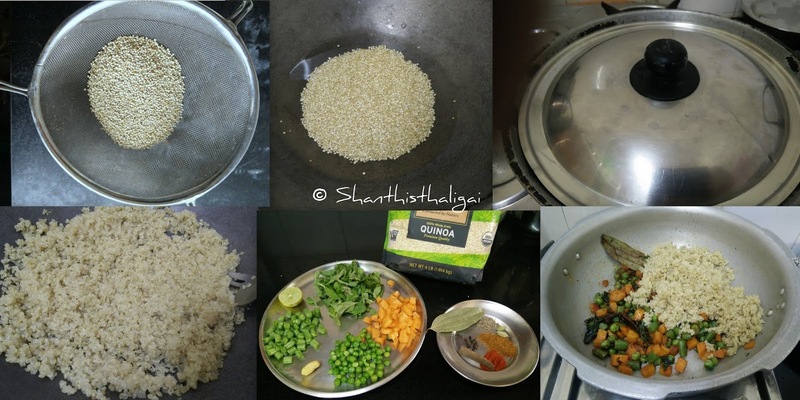 Quinoa Biryani is an amazing way to combine veggies and spices to make the protein-rich Quinoa flavorful. Wash quinoa a couple of times, preferably 3 or 4 times. Combine 1 cup of quinoa with 2 cups of water or vegetable stock in a saucepan or vessel. Bring to a boil. Turn heat on low, cover and cook for 15 minutes. Switch off the stove, keep it covered and after 5 minutes, fluff with a fork. Keep ready. Meanwhile, in another pan, heat oil in a pan. Add whole spices and saute for a second. Add slit green chillies and ginger paste and saute well. (Ginger-garlic paste can be substituted instead of ginger paste. If using onions, add chopped onions now). Now add mint leaves and saute until it wilts. Add chopped vegetables and salt, sprinkle little water and cook it covered until 3/4th done. Add curd and masalas and saute again until done. Now add cooked quinoa and mix gently. Drizzle melted ghee, lemon juice and fluff gently with a fork. Garnish with coriander leaves. 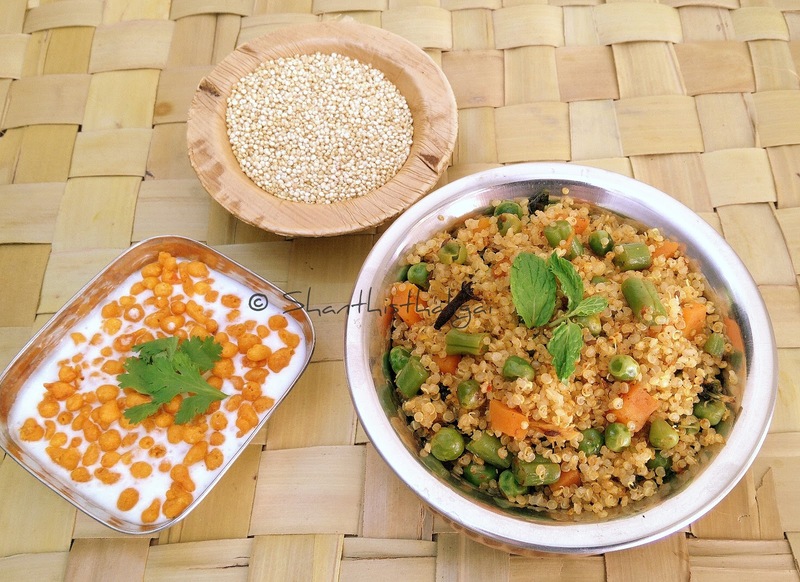 Quinoa biryani is ready. Serve hot with any raitha of your choice. Heat oil in a pressure pan. Add whole spices and saute for a second. Add slit green chillies and ginger paste and saute well. (Ginger-garlic paste can be substituted instead of ginger paste. If using onions, add chopped onions now). Now add mint leaves and saute until it wilts. Add chopped vegetables, salt and saute for a minute. Now add water, curd, masalas and cover the pressure cooker and pressure cook for 1 whistle and then simmer for another five minutes. Turn off the flame. When the pressure subsides, open the pressure cooker / pan, fluff it up with a fork. Drizzle melted ghee, lemon juice and fluff gently with the fork. Garnish with coriander leaves.